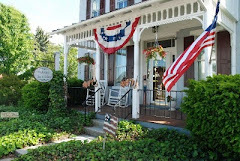 We received a dinner invitation from friends who are local innkeepers at The Smithton Inn in Ephrata. The theme was chocolate. Well, I thought, I’ll just whip up a batch of double chocolate macadamia cookies. Would that be enough for dinner? I certainly could survive for one night on chocolate and wine, but I’m married to a salad lover. So I thought back to a wonderful dinner I had at Carrs (a great restaurant in downtown Lancaster) – it was part of our Chocolate Tour. Tim had served a unique white chocolate dressing on the salad. I know what you’re thinking – my brain also struggled to marry the tastes, but it was delicious. And so I set out looking for recipes on the internet. I found plenty, but several called for ingredients that I didn’t have – chocolate extract, walnut oil, raspberry vinegar......and so the search went on. I came upon Recipe Zaar’s Chocolate Balsamic Salad Dressing. Recipe Zaar is one of my favorite sites and allows you to adjust the measurements from metric to US and increase the amounts. Three ingredients meant that the one hour I had to dress, make a salad, greet guests at the inn, and drive to the party should be plenty of time. I changed the salad to include the ingredients I had on hand: red leaf and romaine lettuce, grape tomatoes, shaved asiago cheese, toasted almonds and vanilla poached pears. To be honest, I think greens with a little more bite would complement the dressing better, but I had to work with what was in my pantry. It’s best to serve this dressing slightly warm – a lesson I learned on a cold night when it began to congeal! A slight reheat did the trick. You also shouldn’t refrigerate this dressing. Everyone loved it, and the salad was a nice complement to the mole chicken and Cincinnati chili that were also on the menu. Oh, yes, I took the cookies too – just in case the other three desserts wouldn’t be enough – after all, you just can’t have too much chocolate for dinner. So the next time you are looking for something unusual, try my newest salad and dressing combination. Sorry I don't have any pictures of the salad....we ate it! Melt over low heat and stir occasionally. Serve warm. How interesting...never heard of a chocolate salad dressing until now! I can personally attest to its deliciousness!! Thanks for the wonderful treat AND the recipe!